Hello and a super happy Tuesday to you - I have been playing in the craft room - yippeee - oh I have had so much fun - no dead lines to meet - just relaxing fun - ahhhhh it's glorious and to top it off this is only day 2 of my holiday. But I haven't just sat and played by myself (that sound's terrible - but you will see what I mean) I have had some inspiration from the lovely Therese from over at Lost in Paper. Isn't it just sooo lovely!!!! As you know - I never copy any ones work completely just use the original for inspiration - but I just couldn't deviate too far from the original as I love it so much!!!!! I did change a few things - like working with a square card - as I prefer square (more room to play). And my little bee already had some of his flight path already stamped so I just added a few extra dashes. So a huge big Thank you to Therese for the inspiration and I hope she doesn't mind me casing her gorgeous work - pop over to Lost in Paper and have a look at the fantastic cards she makes. The videos she does are great - whenever they arrive in my inbox - I save them for a special occasion when I have some spare time to sit and watch them carefully. Stay tuned because I have some more stuff I would like to try in the next couple of days. 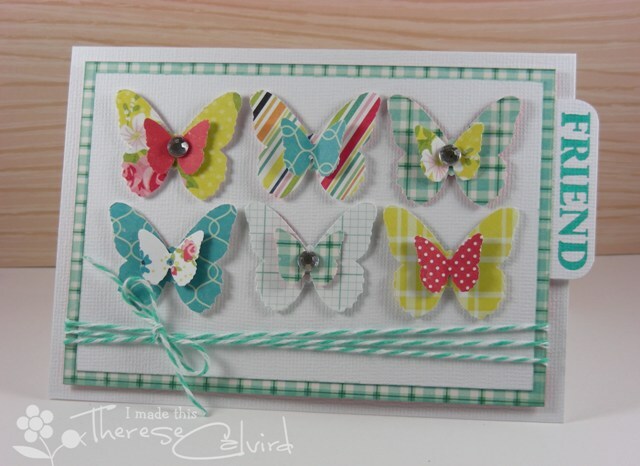 Two fabulous cards, love all the butterflies!